A parliamentary report of 1777 recorded parish workhouses in operation at Bicknoller (with accommodation for up to 10 inmates), Carhampton (30), Clatworthy (8), Crowcombe (7), Dunster (30), Minehead (60), Nettlecombe (24), Old Cleeve (50), St Decumans (60), and Wotton Courtenay (16). The Dunster workhouse was located at what is now Millstream Cottage on Mill Lane in Dunster. Carhampton's workhouse was situated at the car park of the Butchers Arms public house on the north side of main road in Carhampton. MINEHEAD is about 3 miles long and rather more than 2 miles wide, with about 1,220 inhabitants, many of them weavers of coarse cloth. 110 houses pay tax, about 170 exempt. There are 11 alehouses and one inn. Prices of provisions: Beef and mutton, 4d. per lb. ; pork, 5½d., butter, 10d. Common labourers get 6s. to 7s. a week, with two or three pints of ale or cider a day. There is one friendly society with about 90 members, whose rules have been confirmed. They have about £300 in the funds. No member is admitted unless he can earn more than 7s. a week. Rent of land £1 to £3 an acre. Farms mostly small, but of late farmers are desirous of extending their farms. Tithes partly taken in kind, but mostly compounded for. Land tax about 1s. 10d. in the pound. There is a large common on which a great number of sheep are kept. A few acres have been enclosed and produce good crops. The Poor are maintained in a Workhouse, for which a rent of £6 5s. is paid by the parish, who also rent a large garden for £1 1s. The governess has a salary of £5 5s. a year. Table of diet: Breakfast—Sunday, half-a-pound of bread, and a pint of small beer; other days, broth. Dinner—Sunday, Thursday, beef or mutton ; Monday, Wednesday, Friday, fried greens with potatoes and bread; other days, oatmeal and water boiled, and meat. Supper—Sunday, Monday, Wednesday, Thursday, Friday, bread and small beer; Tuesday, Saturday, bread and cheese. The earnings of the Poor have varied since 1760 from £5 7s. 10d. in 1782 to £20 12s. 11d. in 1792. When the rate was first made, in 1735, it was laid at 4d. in the pound on houses, and 6d. on land, and amounted to £63 3s. It has since been reduced to £53 1s. It is thought that the rate cannot be now more than 3d. in the pound on the net rental, as lands are very much improved. There are generally about 30 paupers in the Workhouse; 20 out-pensioners are partly maintained by their friends, and receive a parish allowance from 6d. to 2s. a week each. Very few receive 2s., which is the highest weekly sum allowed to an out-pensioner. A labourer, who works constantly with a farmer for 6s. a week, is generally allowed wheat for his family at 1s. a bushel lower than the market price, and at this time few farmers charge their labourers more than 6s. Or 7s. a bushel, for which other persons pay 10s. 6d. or 11s. Before 1760 much live cattle was imported from Ireland. Importation was stopped by the Government, and many cattle which were imported afterwards were seized and sold for the use of the Poor. But as the amount of money was very considerable, and the number of the Poor then wanting relief very trifling, a surplus remained with which an estate in Ottery St. Mary, Devon, was bought. It now produces £20 a year, which are annually distributed among the most necessitous, under the name of cow-money. In Crowcombe, a building known as Church House, opposite Holy Trinity church, once served as the parish poorhouse. 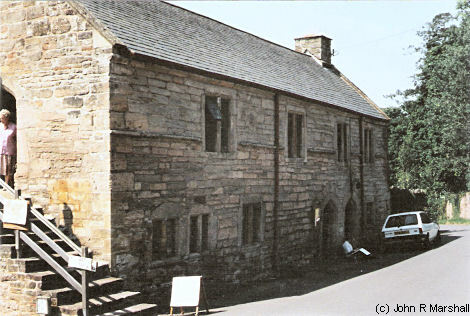 The building, which dates from c.1515, is now a local community centre. Crowcombe former poorhouse from the east. The population falling within the union at the 1831 census had been 18,047 with parishes ranging in size from Stoke Pero (population 61) to St Decuman's (2,120). The average annual poor-rate expenditure for the period 1833-35 had been £9,297 or 10s.4d. per head. The Board of Guardians had their inaugural meeting in May 1836, and later that year acquired a site for a new workhouse on the north side of Long Street on the eastern side of Williton. George Gilbert Scott and William Bonython Moffat were appointed architects to design the building which was required to accommodate 200 and cost no more than £4,000. The building was completed in January 1840, although it had come into operation several months before. 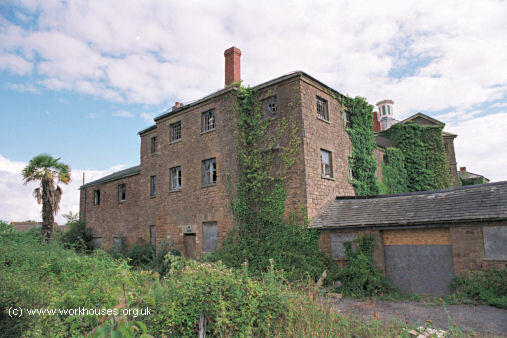 Williton former workhouse from the south, 2000. 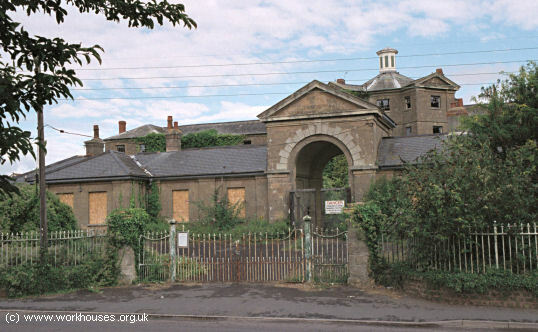 Williton workhouse from the south-west, 2000. The layout of the building is shown on the 1880s map below. The buildings followed Scott and Moffatt's typical layout. 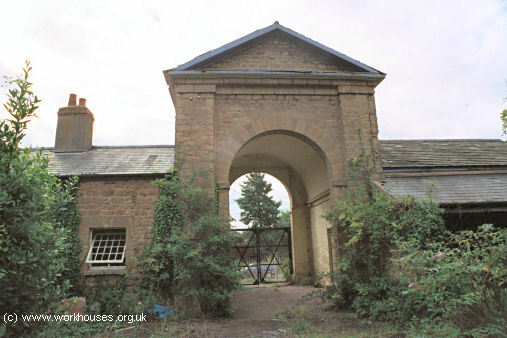 The main entrance to the workhouse was through a large arch which was at the centre of a single-storey front range. To the east of the entrance were a porter's lodge and chapel, and to the west were the Board Room and offices. Williton entrance block from the south, 2000. Williton entrance block from the north, 2000. The main block of the workhouse consisted of an octagonal four-storey central hub, flanked by two three-storey wings to the east and west. Williton main block from the south, 2000. Williton main block and boy's school-room from the south-west, 2000. 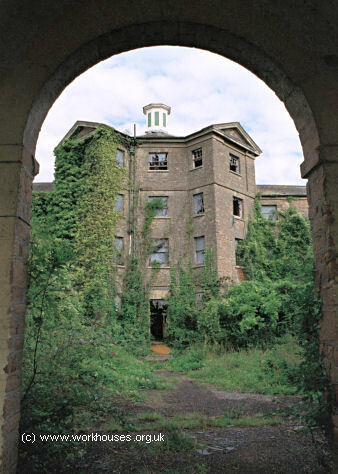 In 1930, the workhouse became Williton Institution. Then in 1948, with the advent of the National Health Service, it was renamed Williton Hospital. Following the closure of the hospital in the 1990s, hospital services were relocated to a new hospital site in Williton. The buildings have now been converted to residential use. 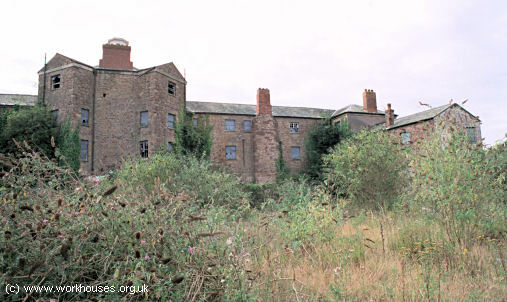 Williton main block from the north, 2000. Somerset Heritage Centre, Brunel Way, Langford Mead, Norton Fitzwarren, Taunton TA2 6SF. Only a few records survive including Guardians' minute books (1839-1930); Ledger (1872-1930 with gaps); etc.